I spent the last two weeks telling anybody who would listen that I didn't think the Denver Broncos were very good. I discussed on this site how they shouldn't be the Super Bowl favorites, posted it on Cosby Sweaters, and also wrote another piece about it for Patriots Life. But now that the Broncos have been eliminated I'm a little concerned. Even though I know that the Ravens coming to Foxboro is a much better situation for New England than travelling to Denver, because I believed the Broncos were greatly overrated I was very eager for the Patriots to play them. I wouldn't be surprised if Ray Lewis can breath fire. On the other hand, Baltimore scares me. In part because they crushed the Pats 33-14 in a playoff game here 3 years ago, outplayed them (despite losing) in the AFC title game last season, and then emerged with a 31-30 victory when the two teams matched up back in week 3. 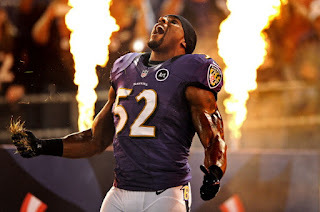 But, the real thing that I am afraid of is Ray Lewis' magic powers. In January of 2000 he was involved in a double homicide. The murder charges against Lewis didn't stick, but he was still convicted of obstruction of justice. Yet somehow he has magically made the entire mainstream news media forget this ever happened. They constantly applaud him for his greatness as a leader. More often than not Lewis' interviews involve statements of how God is helping him and his team win. The reporters just accept this and congratulate him; nobody ever asks "Ray, was God helping you when you and your buddies stabbed two people to death outside a night club and then fled the scene afterwards?" My only conclusion is that he must have some sort of magical powers. Maybe it's mind control. Maybe it's memory erasing. Maybe it's something that strikes such fear into anyone who looks him in the eye that they are terrified to do anything but praise him. Regardless of what it is, his decision to retire after the season has convinced him that the 2012 Ravens are a team of destiny; and I'm definitely a bit worried about the Patriots having to face a guy with magical powers who believes his team's victory is preordained.